The earliest known recording of Barbra Streisand was made when she was thirteen years old—it was recorded December 29, 1955. Her mother paid for a recording session at Nola Recording Studios in New York . (Barbra dramatized this in the opening scene of her Timeless concert in 2000). Streisand sang two songs at Nola: “Zing! Went the Strings of My Heart” and “You'll Never Know.” The latter was included on her 1991 retrospective box set, Just For The Record. “Zing!” has never been officially released, although Barbra allowed an Australian television show to play a few seconds of it during an interview's commercial break. After he met Barbra Streisand in 1961 and became her manager, Marty Erlichman persistently tried to get his talented client signed with a major record label. It wasn't until Barbra stopped the show (I Can Get It For You Wholesale) on Broadway in March 1962 that the record execs started paying attention. “The record people started to come back,” Erlichman said. “The first label that wanted to sign her was Atlantic. But that label was basically jazz, and I told them that I thought she had great potential as an album seller, and since Columbia was the best album-producing company, I had my heart set on them. I told Capitol the same thing. Barry Dennen was Barbra Streisand's friend from about 1960 to 1962. Dennen played many roles in that initial climb to fame that Barbra took. He was her mentor, friend, director, and (according to his book) lover. Dennen recorded Streisand many times with his Ampex reel-to-reel recorder, including live dates at the Bon Soir. When Marty Erlichman and Barbra Streisand were putting together Just For the Record, they tried to make an arrangement with Dennen to utilize the tapes, but were unable to come to an agreement. These songs were probably recorded in 1960 at Barry Dennen's home at West 9th Street in New York City’s Greenwich Village (Streisand lived with him for a while). “Two Brothers” is probably the Irving Gordon folk-Civil War song, written in 1951. Jimmy Daniels was the host of the Bon Soir—he introduced Streisand. Daniels, a handsome café singer in his day, sometimes sang a number or two at the Bon Soir microphone. Streisand appeared on two local radio shows while playing the Caucus Club in Detroit, Michigan in 1961. She was on The Jack Harris Show (2/24/61 and 4/14/61) as well as Guest House, Detroit (2/28/61). In 1961 Barbra recorded a 10-inch 45 rpm acetate demo at Fine Recording Inc., 118 West 57th Street, New York. Most likely, this was a session that Marty Erlichman arranged in order to record Streisand and have something tangible—a record—to give to potential record companies. On one side was “Have I Stayed Too Long at the Fair”, and the flip side, “Come to the Supermarket (in Old Peking)”, with what sounds like a trio backing her. Fine Sound Studio A, built out of the main ballroom of the Great Northern Hotel on West 57th Street near 6th Avenue (the current site of Le Parker Meridien Hotel), complete with such original features as stately chandeliers, hand-sculpted columns, and illuminated stained-glass ceilings. ...Barbra Streisand's first known recording demo. It's one of only ten that were manufactured in the early '60s; eight were sent to record companies and are no longer believed to exist, one went into Barbra's vault, and this one was given by her to a friend who's kept it in pristine condition for the past four decades. In March 1962, Streisand auditioned for RCA Records by recording nine songs, pressed on a 12-inch acetate record. Marty Gold, called “one of RCA's yeoman house arrangers,” accompanied Barbra on piano. The demo includes Barbra's version of a song Shirley Temple sang in a film called Captain January. Written by S. Mitchell and L. Pollack, “At the Codfish Ball” has never been recorded by Barbra —although she did confess that in preparation for 2003's The Movie Album, she was considering recording a medley of Shirley Temple songs! The other curiosity about this RCA demo is the alternate lyric Barbra sings near the end of “I Had Myself A True Love”. Where is he? Has he gone so soon? Barbra and Marty's hard work paid off when Streisand sat down to sign her recording contract next to Goddard Lieberson, the president of Columbia Records on October 1, 1962. She has recorded with Columbia ever since. Streisand's original 1962 record contract was reportedly for five years (one year guaranteed, with four annual options) and gave her a royalty of 5% against 98% of the records she sold (paid after recording costs). 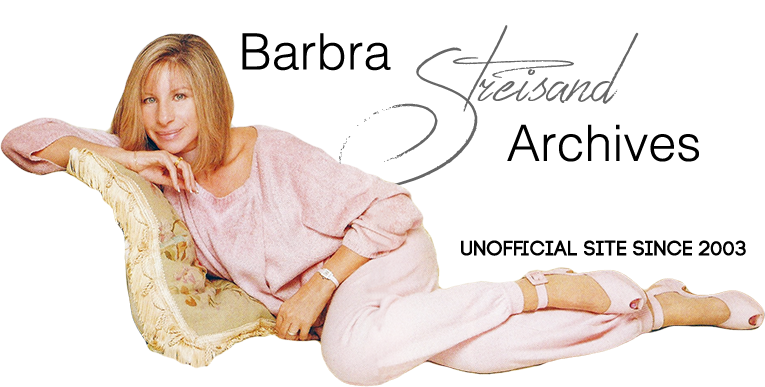 Indeed, The Barbra Streisand Album and The Second Barbra Streisand Album were released by Columbia in February and October of 1963, with The Third Barbra Streisand Album hitting stores in February 1964.